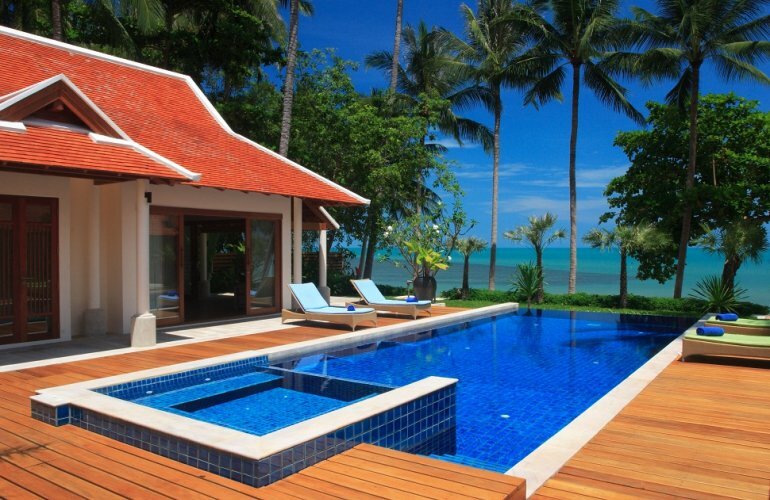 Boasting a prominent beachfront position on Koh Samui’s serene west coast this spectacular property is the perfect place for the discerning luxury traveller. The secure and gated home offers superior island accommodation with spacious dimensions, contemporary design and fabulous views over the ocean and isles beyond. This vast villa offers the perfect blend of peace, luxury and seclusion for a blissful tropical break. Nestled behind a secure stone wall and large electric gates this private property offers exclusive island living with a whole host of outstanding facilities. The expansive 5-bedroom home consists of a series of stunning pavilions set around an impressive infinity edge pool and sea-facing sun deck. There’s plenty of space for families, friends and large groups with five airy en-suite bedrooms, an expansive living and dining area, a large pool and Jacuzzi, immaculate gardens and so much more. A rich tropical welcome awaits you at the grand entrance of this stunning home. Here you will find pristine marble steps fringed with manicured plants that lead up to secure electric gates that guard the paradise beyond. Once inside guests are greeted by a wooden walkway that leads over an exotic fish pool to the villa’s imposing central courtyard. Stone steps on opposite sides of the pathway lead to two parallel pavilions that house four out of the home’s five deluxe bedrooms. Each Asian inspired bedroom boasts spacious proportions and contemporary design. Features include king size beds, gorgeous furnishings, foldaway doors and walk-in wardrobes plus elegant en-suite bathrooms with large walk-in showers and decorative gardens. The expansive living pavilion and generous master suite sit towards the front of the property with uninterrupted views over the ocean and FiveIslands beyond. The sumptuous master suite boasts a modern design and fresh dimensions with an inviting four poster bed, Thai furnishings, a dressing room, attractive artworks and lively accent tones. The room also features a flat screen TV and foldaway doors leading to furnished oceanfront patio. To the rear lies a large en-suite bathroom with twin basins and stairs that lead up to a deep terrazzo tub. Adjacent to the master suite lies the main living pavilion featuring high ceilings, wooden floors and plenty of open-plan living space. The pavilion is equipped with stylish leather sofas arranged around a central coffee table and wall mounted TV/DVD. The area also boasts a fully-fitted dining area with seating for up to 10 guests plus a modern fitted kitchen and breakfast bar. Wide glass doors unfold onto the pool area and gardens to enhance the sense of space and maximise the tropical views and surroundings. Wooden decking and palm fringed gardens flank the pool area which forms the centrepiece of the home. Here guests can enjoy laps in the long pool, a dip in the oceanfront Jacuzzi or simply laying on one of the many luxury loungers around the pool. With an oceanfront sala, outdoor sound system and direct access to Lipa Noi’s pearly white sands this area is ideal for alfresco dining, entertaining or to soak up the warm Samui sunshine.